from Gmail into MS Outlook? When I export them I see "???" in place of the characters. Help! When you export in "Google CSV" format, it saves in Unicode text and it will display Chinese OK, but the field (column) order is all wrong for Outlook. When you export in "Outlook CSV" format, it saves in ASCII text I think, and then the Chinese turns into garbage characters or just disappears. 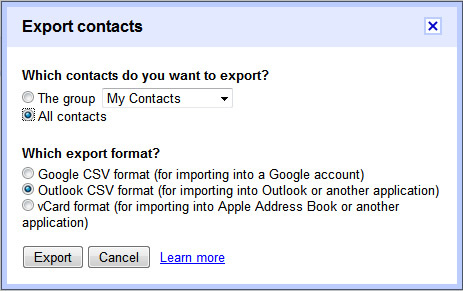 Export for both Gmail (google.csv) and Outlook (contacts.csv). Open contacts.csv in Excel, and save it as an Excel file (.xls Office 97-2003 format) so that it will retain the Chinese characters and be ready for import. Copy/paste the Chinese names into the appropriate Outlook fields in the outlook.csv file. Be careful to match the order and columns for English contacts. Then import into Outlook as an Excel file. Add a Microsoft webmail or Sharepoint account to Outlook. The contacts from that account will be in a separate address book or list within Outlook, but at least they will be there. Prepare a file as described in the Outlook 2007/2010 instructions above, but save it as a "CSV UTF-8" file. Import the contacts into Outlook.com (or live.com, hotmail.com, etc. ), Office 365 Business, or Exchange by following instructions provided by Microsoft. Add that account to your desktop Outlook app by opening the "File" tab, and clicking on the "+Add account" button. If you are a Sharepoint user, there is also a way to import these contacts and then share them with Outlook as a list. Use a syncing solution from a third party. Instead of manually exporting and importing, you can automatically synchronize your Gmail contacts and/or calendar with desktop Outlook, one time or continuously. I have a Google "G Suite" account. This requires you to have your own domain name, pay approximately US $50/year per user, and do administration similar to a Microsoft Exchange account. It includes G Suite Sync for Microsoft Outlook, which I use to share my desktop Outlook calendar and contacts with my Android phone. It's a little buggy, but it works. The Gmail account that sits between them is also a good way to import big lists of Chinese contacts. I hope one of the above ideas works for you. After all that work, you may still have trouble with Chinese in Outlook but at least then you'll be at the stage most people contact me about. You are not alone in having this problem! I get this question a lot, so I've finally added it to this FAQ section. Please feel free to contact me if I can help with anything else.